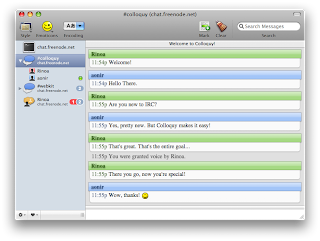 Colloquy features a beautiful and simple Interface, a buddy list for your irc friends. Support for DCC transfers including resume. PlugIns, mIRC color schemes and so much more. 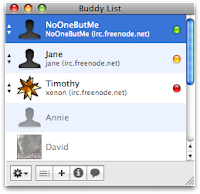 You can connect to multiple irc servers at the same time. An official app for iOS was released as well and features support for all IRC commands, a built-in browser, Push notifications and other features. This looks like an interesting app, but I'll stick with IRSSI. Love the design on macs but i need to have a computer that can play games and dont cost 1000$ more just becuse it got MAC in it and are made of aluminium..
Leestander: it can play games well and if you need you can also install Windows and it doesn't cost 1000$ more then a comparable pc so you should get your facts straight. 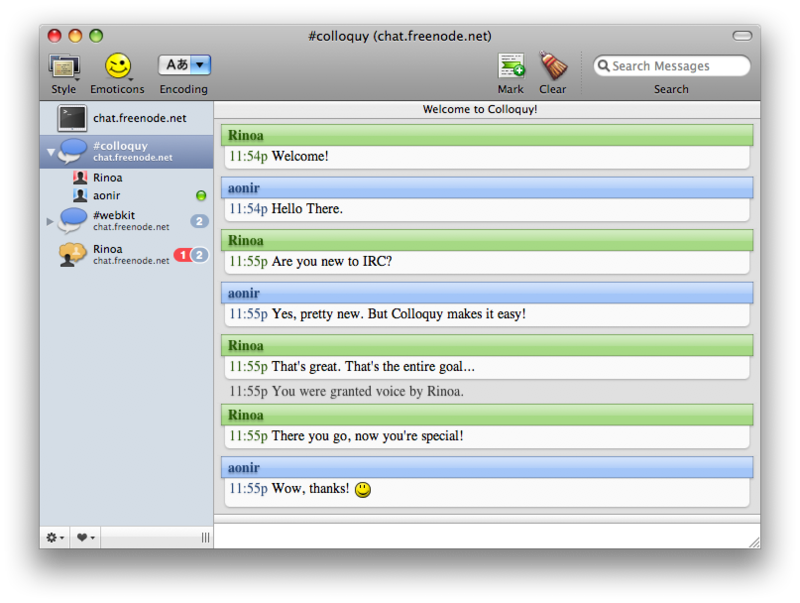 the simplicity and beauty of irc. thanks! wow.. that is some strange view of the IRC. used to old IRC clients. pretty kewl. Looks like a coll app. Ima check it out! Wow, it's been a while since I've used IRC. But if I ever get back into it when I finally have a mac, I'll definitely try this out. Looks very useful. I however, am useless at IRC. Never really spent enough time on it. I've been using this for a while, its a great chat program. Got to love irc. I' using irssi on my linux. No fancy looks but I still love it. Nice program, more pleasing to use then others I have run on my Macs. There is a problem however with Colloquy and Lion . . . local time is GMT/UTC, NOT my local time according to my Mac. Which is currently a real pain as all times on the conversation is off.